For many of us, full ensemble is the most enjoyable part of rehearsal. We hear the full sound of the band and see the full production from the guard. It can be exhilarating. Yet, we frequently find ourselves battling timing issues, and especially when they appear in unexpected ways. We have all been there. Your ensemble cohesiveness is primarily contingent upon your students’ individual timing. Promoting individual timing through playing tests, rhythmic exercises, and metronome training to promote individual timing will pay dividends later. Little will be together if individuals are not confident in their own timing. In a helpful and fostering way, few exercises are more valuable than hearing individuals play with a metronome. A good tool is hearing a rhythmic passage on one pitch to check the rhythm. Sometimes this can cause some student anxiety, but I believe there is a healthy way of doing this! Learning your students tendencies helps you learn your tendencies as a teacher/staff as well as hearing the gaps in student proficiency. Timing is largely contingent on pulse and pulse control. Rhythms are figures inside of that pulse. Pulse is the start of each heartbeat, and rhythm is what happens in between. This may seem overly simple, but it’s quite common to combine them too soon and too often. You cannot always assess a student’s timing based on their ability to play rhythms. Case in point: I have heard students play a rhythmic figure they clearly learned by rote, but they could not slow the figure down because they didn’t understand the rhythm in the relationship to the pulse. So, first thing’s first: Train PULSE. Connecting the body, not just marching technique, to pulse is quintessential because the body helps train pulse. Moving down the field with a metronome on quarters or with music is a great way to connect the body and help you assess individuals’ timing. Connect the body to pulse, play simple rhythmic exercises (quarter, eighth) at different tempi, and you’re on your way for better pulse control. There are many creative ways to get there, but training pulse is just, if not more, important than teaching rhythms. Rhythms are much more complex as a skill, but in some ways, they can be simpler to teach than pulse. If you have great pulse, rhythms are not nearly as complicated. If you think about when you learned rhythms formally, the difficulty was not usually performing the rhythmic idea, but relating it to the downbeat. Without great pulse, you will have very unpredictable results. Rhythms can only be correctly applied to great pulse. Pulse and Rhythms combine to create our students’ sense of timing. Without a highly developed sense of timing, no ensemble (especially one on the move) can perform at a high level. If you are having ensemble timing issues, the tendency can be to rep and rep during full ensemble to fix. The first step to fixing ensemble timing issues, is to train your performers’ full sense of timing first. We all need some guidelines or rules to follow for successful rehearsals. The following Golden Rules will ensure you have many less “rubs” and “tears” in your show. The battery is the pulse when they play. Pulse comes from the back of the field, to the front. Staging of the winds is crucial to ensemble success. Rule 1: The battery is the pulse while playing. Train, train, train your battery to be great individual controllers of pulse and rhythms. Then train some more. The most successful battery ensembles are built on the accuracy of rhythms and pulse by each student individually. Rehearsals should always include daily doses of fundamental rhythmic exercises, and there are no shortcuts.The winds, guard, and front ensemble depend on the battery. They have a responsibility to set, maintain, and control time. Rule 2: Pulse comes from the back of the field, to the front. The front of the field can never control time for the ensemble, unless the front players (solo, or front ensemble) are completely unaccompanied. This is isn’t an opinion, it’s physics. Some of the details of how this works will be discussed in “Sound is Slow.” As you get your drill, study it with this concept in mind. There are many great resources you can find online, but these two videos HERE and HERE by Bill Bachman and Matt Savage (two legends), are required viewing. Because of the amount of articles and materials available on this, I’m not discussion much more. Rule 3: Staging of the winds is crucial. By implementing the first two points above about timing, you can identify difficulties in the drill before you ever see or hear it. Are the winds staged in ways where pulse identification or performance will be overly-difficult? I think we are quick to identify the “hard drill moves” or the “difficult music,” but there are many times “ensemble difficulty” is overlooked when the drill is received, and we wait until the drill and music are learned before we discover the challenge. Many times, when drill is received, there is usually a sigh of relief that a team has material in hand, and it’s on to learn! I advise taking some time to study your drill before handing it out! Drill writers have a tough job, but just like music arrangers, can make mistakes, or write moments that need extra explanation or tweaking. Sometimes you can be put in sets that accidentally or unnecessarily make playing to the pulse overly-difficult, or worse yet, impossible. The laws of physics are strong. 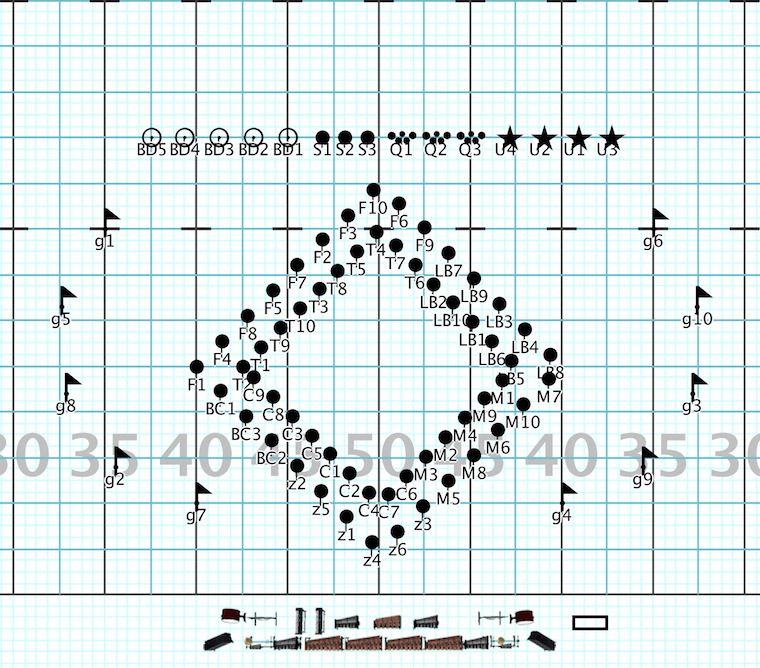 Now, if we were to receive this drill and knew that the brass were playing with the woodwinds, we would need to create a solution, because from T6 to BD5 is almost 37 yards! More on that in Sound Travels Slow. Rule 4: Prepare tempo changes *¡HOT TAKE ALERT! * If you get an arrangement with a subito tempo change, you may want to call the composer/arranger. Ask the he/she what their strategy is to perform it reliably. It’s possible there is an idea that has been worked out with the drill designer, so it’s best to check. An unprepared subito tempo change is an ensemble rub or tear waiting to happen. There are a few ways to introduce a new tempo, but most of them involve enough counts for a new pulse to be established in the battery. When you think about every single person in your band, ages 14-18, having to all internalize a new pulse on a subito tempo change, you may realize it’s an unneeded challenge. Rule 5: Sound is SLOW. We have all seen or heard this scenario at some point: “LISTEN BACK FRONT ENSEMBLE!! !” Simple, right? It’s just not always that simple. Sound travels so slowly, it needs its own separate section to unpack. Rule 6: Train your Drum Majors. We will discuss this in its own section as well. This is probably the hardest concept to adapt, as it takes time and trial and error. No two drum majors are exactly alike, and training the human element, can be the most complex of all. A disclaimer before we continue: I am not a scientist. Heck, the only “A” I ever received in a math class after 9th grade was in college. The course was border-line remedial and I managed to tough out… an A minus. If you are comfortable with just how slowly sound travels, you don’t need to be an astrophysicist to understand the following concepts. In fact, if you understand thunder and lightning, which all band directors do, you are well on your way. Lightning can ruin a rehearsal very quickly, and for good reason. We’ve all been there, and in TX this year, we are all there. We have apps to tell us how far away lightning is, but there are a few rules of thumb to calculate our distance from lightning. We count seconds to see how long it takes the thunder to reach us. I was taught incorrectly many moons ago, that for every second, add a mile (1s=1 mile). For years, I never thought anything of it, but we know how long a mile is, and since sound travels around 1150 feet per second, that rule of thumb can’t be right. It takes the sound of thunder roughly 4.5 seconds to travel one mile. That means for every 5 seconds from a lightning flash, to the sound of thunder, add a mile and you’ll be close. That’s a long time! You saw the lightning in about 5.3 nanoseconds (thanks google), but heard it many seconds later. As a reminder, a nanosecond is a billionth of a second. Sound is so slow, I almost feel sorry for it. SOUND IS SLOW. It really matters that we hammer this over and over again. Especially if your band tower is right on top of the band, it’s easy to forget this. All of this writing, and all of your reading comes down to this: How much distance creates a problem with how slow sound is? How far away do you have to be to create a “tick” or “rub” and how much time is actually between those notes for us to notice an issue? Hearing a tick/bad attack/rub can be somewhat subjective. This helpful video can serve as a starting point for you to identify. On the video, your speakers matter a bit, but I imagine most folks can hear the grace-note sneak in around 3-4ms. Starting at around 20ms, you can hear two clear and distinct sounds. So for the sake of argument, let’s agree 20ms is an unacceptable attack. 22.9 feet. That’s it. That means in less than 8 yards front to back, two people playing at the exact moment in time will produce a very noticeable delay to the box and/or audience. If this number surprises you, as it did me, it could seem like marching band is a giant Whack-a-Mole game of timing issues. Here are two “rules of thumb” to keep in mind as well. If performers are 10 or more yards away from each other front to back, there needs to be a strategy for getting their sound to the front at the same time. Make sure there is a pulse for the front group to listen to. You may have several layers of this if it is a large set. Now we hopefully get a better sense of how the slowness of sound affects our group. In the fourth and final chapter, we will discuss some scenarios along with the BONUS RULE: Train your drum majors, to apply the information. Let’s be honest, we probably spend more time talking (more like telling) to our drum majors than actually training them. Of course drum majors need to be pillars of the bandsman/bandswoman, but they also need real training in their performance art. If you earned a music degree, you spent a year in conducting class, so it seems appropriate to spend 15 minutes a week with the drum majors on their craft as well. If the band is large, and the means are available, it is completely appropriate, and even encouraged, to dedicate some funds to train the drum majors. Make sure that if you do have someone coming in to work with your drum majors, that they discuss and understand ensemble issues. Technique and pattern are very important, but knowing how sound travels and creates sound delay, is key to their success, as well as your ensemble. Uniformity. How far the arms are out, how far down and out their pattern is, where the ictus is, are all elements that need to be defined and trained. Ictus placement is key. Decide not just where it is in space, but what part of the hand is considered hits the ictus. Make sure it is defined, clear, and communicated with your ensemble. Do not be afraid to ask your percussion staff on the field what they think. They’ll be able to tell you what they see and trust from your drum major(s). Watch the center snare drummer’s feet. This is a pretty common tool, and while it works much of the time the battery plays, staging issues can cause break downs. If the winds cannot hear the battery, or they are far enough away to create a delay, they will have to alter their interpretation of the drum majors’ hands to play with the battery. This point could be an entirely new article, but why draw this out even longer? Show design. The drum majors need to know where and how all of the ensemble pieces work together. Similarly, they should not just know, but understand their role in pulling off a challenging production. Score study and drill chart study are required elements of any knowledgeable drum major. In this set, z4 (in the front, 50yd line) is roughly 20 yards in front of F10 (+-4 steps behind hash, 50). If z4 and F10 play exactly with the drum major’s hands, z4’s sound will be roughly 52ms ahead of F10. Use your rules: Staging of the winds is crucial to ensemble success. Meaning, ideally this set would not have the whole group playing. In fact, for this particular set, they are not. Why? The distance between the battery and the front winds is so large, there will be intense delays. However, if you have a tutti section and get this drill, use some other rules to help the group play together. Rule 1: The battery is the pulse when they play and Rule 2: Pulse comes from the back of the field, to the front apply here. If the group in front of the battery, lets say F7 on side 1 to LB9 on side 2, is 100% with the battery, then the winds in front of those groups can listen back to their fellow wind players to play together. The distance from the bass drums is troubling, but I digress. Lastly, z4 will not be able to play with the drum majors hands. In fact, z4 will have to play considerably behind the drum major hands (52ms to be exact) to play in time with F10. Photo Credit: Jonathan Yoo Visual Design (Set used out of context) It actually gives me anxiety to think about the group playing in this formation. With this set, we’ll pretend it’s the end of a drum feature. This happens a lot where the drums finish playing up front, but don’t have time to move back. Jonathan Yoo (the drill designer here) didn’t make this mistake, but I’ve seen and taught drill like this for other teams. The first fix is on the front end: If your drill designer sends this to you, and the winds are playing with the drums, please ask for a rewrite. People like C9 and M9 have almost no shot at playing together. Unless you’re lip-syncing at the Super Bowl, trying to get performers to play with 70 yards between them is a mostly bad idea. If they were clustered together, or connected more as sub-sections, you could salvage the situation. If you are forced to use this set, utilize RULE 2, as well as some of the advice in the drum major training. The players furthest back, have to play on top of the drum majors’ hands. Their sound has to get a running start for it to line up with the battery and to the front. And as many people as possible have to listen back. Most groups here cannot listen to the battery. ¡HOT TAKE 2! I am a big believer in Juice and Squeeze. How much squeezing would you have to do, to make this juicy set worth it? If you had a set like this, and it undermined multiple rehearsals, wouldn’t you just rather get it rewritten? If your drill designer requests additional compensation, your car wash to raise the money to pay him/her is less of time-drain than the hours you’d use putting this set together. Counting over the Speaker system Please do not do this. Especially while the metronome is on! We the people of the marching world beg of you, to please never count over a speaker system. If you are counting, you cannot listen. If you’re not listening, why are they playing? If it’s just drill, why isn’t just the metronome on? IF you’re counting while the metronome is on, by the time you hear the click, it has long left the performer’s ears. They now have two sounds to listen to for every beat. Their feet nor music will make any sense. Let’s just all hold hands together and agree to never do this as the great people of the marching arts. WE CAN DO THIS PEOPLE! I BELIEVE IN US! Now that we’ve gone through all of these rules and scenarios, it is time to put them in action. May your rehearsals be filled with rainbows and beautifully-timed ensemble moments. Feel free to reach out to me on Facebook or by email david@contemporaryvoice.com All the best in the remainder of the marching season!